How much water is used for irrigation? That is an important question not only for farmers and water resource management agencies, but also for the facility managers of golf courses and football pitches. On a global scale, we already have the answer to this question. 70% of water withdrawn from rivers, lakes and groundwater is used for irrigation. That is a huge number! Irrigation consumes the most amount of water on our planet. Where does this percentage come from? From statistical surveys and spot acquisitions that were done 5 to 10 years ago. We all know that the demand for water is increasing tremendously, and population growth and climate changing will continue to make the situation worse. These outdated surveys, obtained from sparse and non-uniform information, are of limited use. So how do we solve the problem of measuring water use in irrigation for current, past and future conditions? We, the Hydrology team of CNR-IRPI (National Research Council – Research Institute for Geo-Hydrological Protection), have the solution. 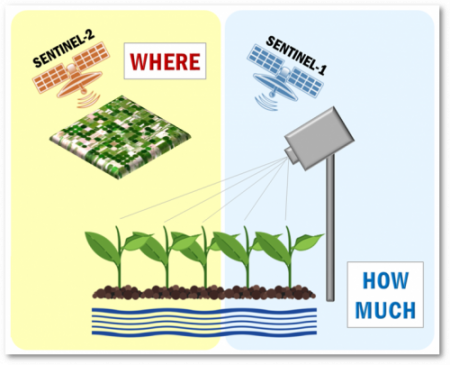 By using Copernicus Sentinel-1 and -2 satellites, we are able to provide daily estimates of the water used for irrigation on a field scale. We have already tested the approach in Italy, Spain, Morocco and Pakistan with success, and we have long-term expertise in using microwave observations to measure soil moisture and precipitation from space. With our proposition, we want to help people interested in saving water, and then to optimise water use for agriculture and other sectors. In the near future, this will be absolutely necessary if we want to exploit the water resources of our planet in a sustainable way. In 2018 we submitted our idea to the Copernicus Masters, an international competition that awards prizes to innovative solutions, developments and ideas for business and society based on Earth observation data…and …we won the BayWa Smart Farming challenge! As a part of the prize for winning, we had the opportunity to participate in the Copernicus Accelerator Programme, which started with a 2-day bootcamp in December 2018 and took place Marseille, France. The biggest advantage of taking part in this bootcamp was the chance to network. We met several people with extensive experience in business and in the market, as well as those who have recently funded technological and earth observation start-ups. It is a very different ecosystem when compared to our world as scientists. During the two days in Marseille, we learnt a lot about how to advance our idea from a scientific publication to a potentially marketable product. Of course, we still have a way to go, but we have started to investigate how to get there. The Awards Ceremony of the Copernicus Masters took place on our second day in Marseille. We were awarded on stage at the ‘Space Oscars 2018’ in which Jörg Migende, Head of Agricultural Distribution & Head of Digital Farming at BayWa AG, presented our prize for the BayWa Smart Farming Challenge. A very exciting day, it was a wonderful experience for us! We came back from Marseille with an introduction to on how business works, and with our own mentor from the Copernicus Accelerator 2019. She will support us to further improve our understanding and awareness about building a business plan and approaching potential customers. 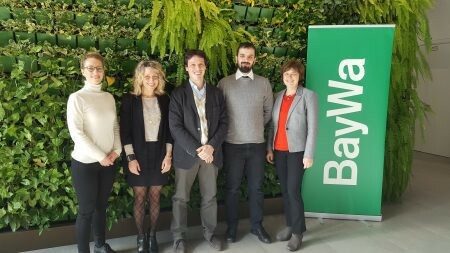 On 29 January 2019, we flew to Munich for our first official meeting with the experts of BayWa, and its subsidiaries Vista and FarmFacts, who are interested in our idea of measuring irrigation from space. We met with representatives of the three companies, presented our idea and received the first feedback from them about how to put our scientific results into practice. Together with BayWa, we will have the opportunity to develop our idea in different countries, under varying conditions, and in field trials. With the support of BayWa market experts, we plan to develop a go-to-market strategy and to identify potential customer groups. This support is absolutely essential to us. We are at the beginning of our startup journey, and are very open and happy to see that our idea could provide direct benefits to the private sector, and thus support people working in the agricultural sector. With the support of the experts from the Copernicus Accelerator Programme and BayWa, we are confident that we will have a rewarding experience. Luca Brocca received a Ph.D. degree in Civil Engineering in 2008. From 2009-2018 he is a Researcher\Senior Researcher at the Research Institute for Geo-Hydrological Protection (IRPI) of the National Research Council (CNR) of Perugia (Italy). He has authored and co-authored 120+ journal papers, and has been cited 5,000+ times. Luca develops innovative methods for exploiting satellite observations in hydrological applications, such as floods and landslides, drought and agriculture. He actively participates as the Principal Investigator (PI) and co-PI in several research projects within the frame of Italian and European programmes. 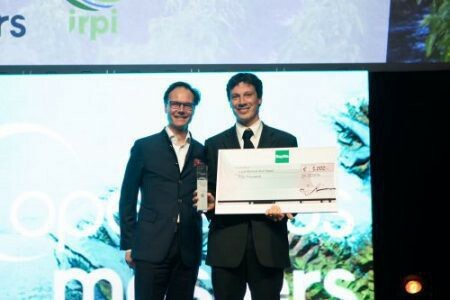 Recent innovations are the SM2RAIN algorithm for estimating precipitation and the irrigation algorithm for which he won the BayWa Smart Farming Challenge of the Copernicus Masters 2018.